The Archaeological Museum of Santorini in the heart of Fira has an amazing display of exhibits that reveal the history of this blessed island. A variety of unique collections of sculptures from the Archaic to the Roman period is hosted in the museum that is a must-see when visiting Santorini. Also the museum's highlights are the ceramic vessels and vases that date back to the Geometric and the Hellenistic era that are really impressive. When visiting a place like Santorini with its rich tradition it is impossible not to instantly fall in love with its character and history. if you think that you will not find much interest in the Archaeological Museum of Santorini then think again. This is so much more than just some sculptures with no life. This trip to history will remain in your memory for ever. 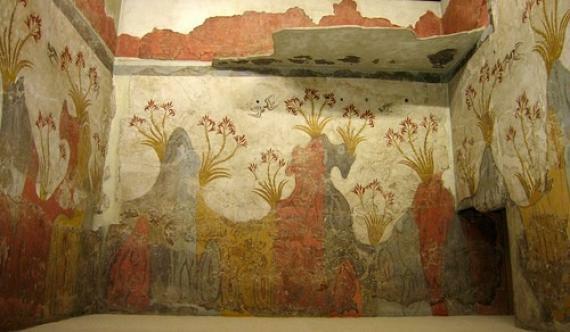 The Archaeological Museum of Santorini has timeless value that you will appreciate. A variety of outstanding archaeological findings are hosted in the museum containing artifacts from excavations on the island. Built in 1960 by the Ministry of Public Works was meant to replace the old museum (built in 1902)that had collapsed at the 1956 earthquake. A perfect collection of geometric red and black vases from the fifth century BC will cast a spell on you and you will also be amazed by the museum’s sculptures of the Hellenistic and Byzantine period. Sculpture findings from the Archaic and the roman period revive in a travel to time that will not only offer you a trip back in history but will also remind you that Santorini is so much more than a few drinks and a swim. Santorini is the island of memories and history but it is also the island of today offering you all the modern facilities in hotel accommodation terms as well as food and fun are concerned. An island where the old meets the new and history is written every single day!